Taegerwilen, Switzerland, January 28, 2015 - - Photonics production in Europe in 2014 reached a volume of EUR 60 billion. According to an analysis of preliminary 2014 data by Optech Consulting that figure is up 3% from the EUR 58 reached in 2013. The growth was mainly due to an increase in the industrial segment. Also the production volume of the health care and life science segment increased moderately as well as the optical components and systems segment. The industrial segment, with a share of 39% of the total for 2014, makes up for the largest part of the European photonics production. This includes lasers and laser systems for materials processing and microlithography as well as components and systems for image processing, sensing, measurement and analysis. Other segments comprise health care and life science (14% of the total), energy and lighting (13%), optical information and communication (9%), and optical and opto-electronic components and systems (25%). 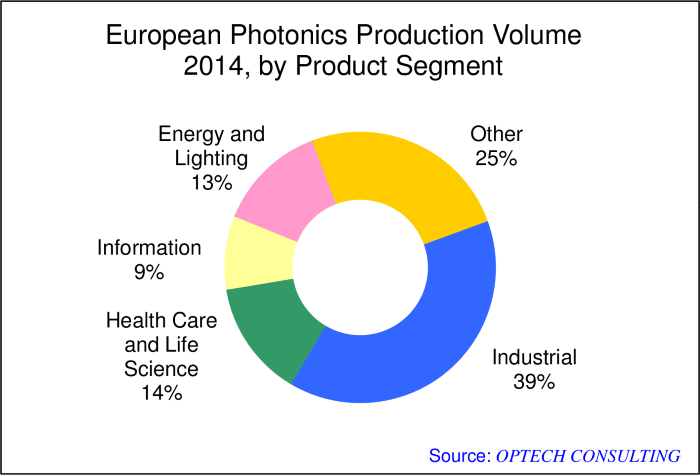 The EUR 60 billion European photonics production volume for 2014 is the second largest ever achieved. The largest volume of EUR 62 billion was recorded for the year 2011. In 2012 and 2013 the production volume was depressed, mainly due to the meltdown of the European photovoltaic industry, which suffered from fierce competition from producers in Asia. 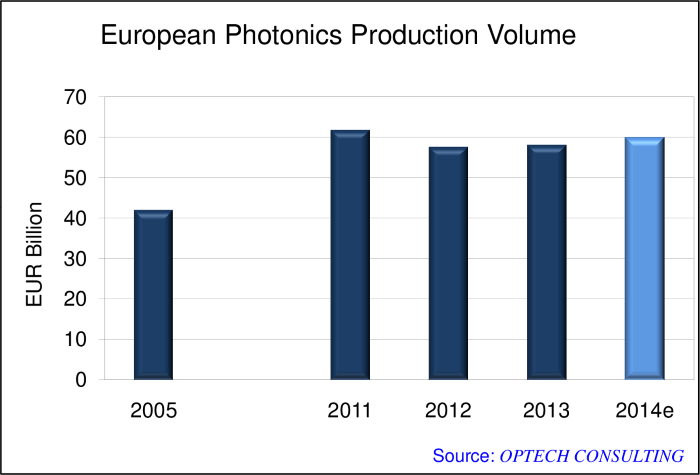 Also, the production volume for photonics based information technology, which has been a weak area of the European photonics industry for a long time, contracted further. In contrast, the European photonics industry performed well in its areas of strength, which include the industrial segment, health care and life science, and optical components and systems. By geography, Germany is the largest producer of photonic products in Europe, besides the Netherlands, the UK, France, Italy, and Switzerland. Although its share decreased during the last years due to the contraction of its photovoltaic industry, Germany still accounts for more than 40% of the European photonics production.